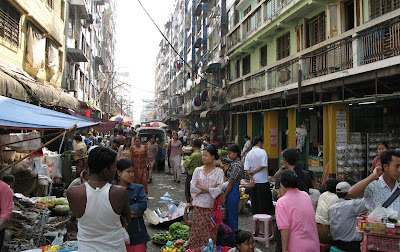 Chinatown Yangon (Rangoon) is the most congested area in the entire city. There is a sizable Chinese population there and during the Chinese Lunar New Year Celebration the scene is very festive and even more chaotic than usual. Alan and I were both feeling rather poorly during the Chinese Lunar New Year celebration in Yangon last year (no doubt from something we ate). This is a short clip from a Lion Dance ceremony outside our hotel. Lion dances are performed to bring good luck and to ward off evil spirits with the beginning of the Lunar New Year. Loud music, and firecrackers, with the lion's movements are used to scare away "evil spirts". Eighty percent of foreign tourists visiting Thailand eventually make their way on to the island of Phuket. The flight from Bangkok is just over an hour to the large island but once you arrive, it will probably take you just as long to get to your hotel. 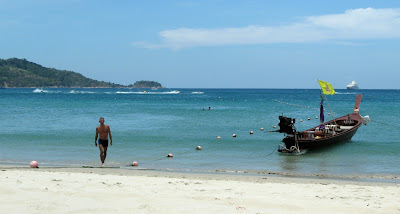 Most tourists will end up staying near one of three beaches; Patong, Karon, or Kata. Patong is the main tourist beach with hotels lined up into the hills. Shops, nightclubs, and bars fill the streets close to the beach. Restaurants are everywhere serving up anything from Italian, Indian, to Sushi. There are of course Thai restaurants as well with an emphasis on seafood (fresh fish, squid, lobsters (Phuket lobsters have no claws), shrimp and prawns). Patong beach was the hardest hit area in Thailand during the tsunami of 2004. Some of the most dramatic footage of the tsunami, seen over and over again on television, was taken by tourists in their hotels near the beach. The bulk of the Thailand causalties took place there. Today the area is completely back to normal with it's shop-lined streets and a whole new fleet of tuk-tuks. To escape the tourist ghetto of Patong, we usually head to Nai Harn,a small crescent shaped beach on the southern tip of the island. Originally, the beach was owned by a Buddhist enclave located just off the sandy beach in a lightly forested area. Development was kept to a minimum and today there are still only two hotels on the beach. Our first two visits to Nai Harn Beach were in 1999 and 2000, and we stayed at the only hotel on the beach at the time, The Royal Phuket Yacht Club. 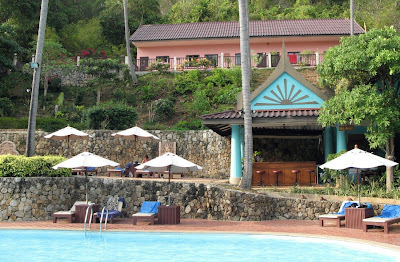 The hotel is terraced along a slope on the northern end of the beach. All 110 rooms have a private terrace, many larger than the room itself, overlooking the sea. Even during high season, the hotel never seemed more than half full. 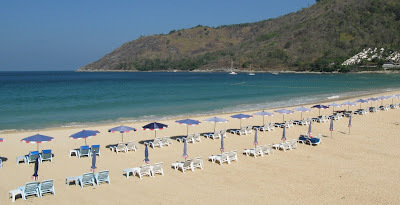 Nai Harn is also a beach where more local Thais seem to frequent. Usually appearing in small groups, especially around sunset or on days that were a bit overcast, they would find shady spots to hang out at before they make their way into the water. Many Thais we saw went right into the water fully clothed. They didn't have on their "best" clothes but it was not unusual to see whole families in the water with jeans and shirts on. As far as tourist beaches go, Nai Harn is difficult to beat. The water is warm and clean, some decent snorkeling on the north and south ends of the beach, and no jet skis for rent. We would spend our days, just about every day, on the beach. The scenery would change as people come and go. We'd read, write, swim, nap, eat, all right on the beach. Beach chairs do line the beach and we'd rent them for around $3.00 a day. The island standard price doubled from 50 baht per day ($1.50) to 100 baht per day about a year and a half ago and there was some talk of doubling it yet again when we were there last year, but I don't know what's become of it. The price of tourism is showing on the island though. Everything is slowly being stretched to the limit. With more and more areas being developed for tourism, the beaches are getting packed with tourists and natural resources are becoming scarce, especially water. We did talk with a woman running a small laundry who was complaining she was only allowed to turn her water on for three hours a day to do laundry, and when she did, most of the water flowing from her tap was dirty. That's not what you want when you're in the laundry business. The tourist industry is trying to combat some of the effects of tourism on the island of Phuket by raising prices; from accommodations, to food, to beach chair rentals, in hopes of driving out some of the bottom budget travelers. Unfortunately, with over 5 million visitors to the island last year, it's still more than the island can currently sustain for any extended period of time. Lunch on the beach (Thai Barbecue chicken and Papaya salad). I'd say it's relatively safe to eat on the beach. There is no running water but everything is usually iced-down before cooking. Street food at the Nai Harn Temple fair. While we were at Nai Harn last year, there was a week-long fair at the Nai Harn temple to commemorate the casting of a new buddha for one of the temples in the complex. And there is always Durian, as well as beetles, crickets, and other assorted grubs. The casting of the new Buddha image. Built in 2001, this lower priced alternative to the Royal Phuket Yacht Club has been our choice of places to stay at Nai Harn. Rates today run around $69 per night compared with $375 at the Royal Phuket Yacht Club next door. During high season the hotel is usually filled with mostly Europeans, the majority of which are mature German couples. We're usually the odd pair at the hotel and not much attention is paid to us. The rooms are clean and comfortable and the breakfast buffet is good. It's right across the road from the beach and we usually spend a month or more there without being the least bit bored. Club One Seven in the Patong Beach area. The original Club One Seven was wiped out during the tsunami. The owners relocated to a street on the southern end of the Patong area, just a 5 minute walk to the beach. If you want to stay in the Patong area and don't need to be in the thick of things, this would be a good choice. It's a small gay owned and staffed 15 room property away from all of the night noise of Patong. Long tail boat for rent on Patong Beach. If you're looking for a quiet deserted beach destination, Phuket is probably not for you. Most beaches on the island are "tourist beaches" set up for as many people as the beach can bear. We've only been there during the high season (November through March) and it's usually full of people escaping cold winters back home. If you do decide to go, breeze through Patong and stay at Nai Harn. November and March are probably the best times to go. Chengdu, (not to to be confused with Chengde) the capital of Sichuan (not to be confused with Szechwan) province is a sprawling city with some ten million people located in southwest China. It's not a destination many people would put on their list of places to see when visiting China but it is where we've had two of our most memorable dining experiences. Back in the mid-90s, we took two trips to Tibet which required a special permit which was to be issued in one of two "gateway" cities, Xian and Chengdu. If there were any politically motivated demonstrations going on in Tibet at the time, all foreigners were to be denied entry. On our arrival in Chengdu, we were picked up by our guide and taken to our hotel in downtown Chengdu. "Why do you come to our great city of Chengdu?" we were asked. We didn't tell him it was only to pickup an entry permit to Tibet, but rather to see the great sights the Sichuan capital had to offer. "Ah, Yes, there are a great many things to see here". There are famous old temples, museums, monsteries, and a Panda Park. Eighty percent of China's estimated population of 1000 wild Pandas reside in the Sichuan Province and the thought of seeing some Pandas certainly peaked our interest. However, the Panda Park turned out to be an amusement park with a Panda theme. Let's see, Panda roller coaster rides, and ferris wheels, no thanks. 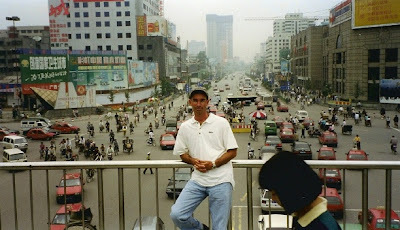 Chengdu was trying desperately to be designated a "tourist gateway city" in the mid-90s as evidenced by all the banners and signs (all in Chinese) hung everywhere in the downtown area. It wasn't one of the five destinations Nixon visited on his groundbreaking trip to China, and all those cities had prospered greatly from tourism. Tourism was on the rise in Chengdu though, but mostly Chinese tourists from other provinces, so we were still the odd pickles in the barrel. Everyone spoke Mandarin and very few spoke Engilsh. We did visit some very nice temples, parks, and monasteries there but eating is what we will remember the most about Chengdu. Sichuan Province is well know for spicy dishes, hot pots, mapo do-fu, smoked meats and incredible teas. Restaurants in upscale hotels at the time usually served a toned-down version of the local cuisine, more suitable to the tourist's palate at a highly inflated price. We decided to take our chances outside the hotel. Wandering around the back streets, we decided to go into what looked like a clean place to eat. We weren't exactly sure if it was a restaurant at first but once inside, just behind the old wooden carved doors, were a couple of bowing, smiling girls waving us into the dining area. We were quickly seated in the small crowded room with all eyes on us. Menus, in Chinese only, were handed to us and we gazed blankly at them before looking up at each other. "You don't suppose they have a menu in English, do you?" Even if we knew how to ask for an english menu, we knew there wouldn't be one. A tallish man with a cheshire smile etched on his face eventually came over and proceeded to speak to us in mandarin. Could it be the specialties of the house, or maybe the daily specials which he was reciting? We pointed at the menu and he continued to smile and nod his head. We tried to ask him if there was anyone there who could speak some english and his smile slowly faded as he relized our predicament. He turned away from us and yelled something in mandarin prompting stares and laughter (I'm pretty sure it was - "these people can't speak or read Chinese."). Soon, a man appeared through a thin cloth curtain separating the dining area from another room and made his way towards our table. Smiling, with a cigarette in his mouth, dressed in a tank top and shorts, he said "eat". Yes indeed, we wanted to eat and he proceeded to help us order our meal. He wasn't really able to speak english but his limited vocabulary, of maybe thirty words, was enough to get us what we wanted. As he made his way back to the mah-jong game in the adjacent room he proudly received his "job well done" from the restaurant staff and patrons. We had some of the best dishes we've ever had in this tiny little restaurant, from spicy do-fu with preserved radishes to our favorite Sichuan dish, shredded smoked duck with spring leeks, cabbage and peppers. All in all, we had three large plates of food with steamed rice, two large bottles of beer, fresh fruit, for about three US dollars. There were plenty of smiles and nods as we left. The mah-jong game in the next room paused as we were bid farewell by our "interpreter". As we made our way out towards the large carved woooden doors, two girls chased after us with the tip we had left on the table. We pointed at the money, then at them, and left as they smiled at each other. The next evening, we had a spicy Sichuan Ostrich dish but that's another story altogether. I'm not sure how Chengdu has changed since we were there last. I'm certain that skyscrapers have popped up all over the city but if you do decide to go, go for the food. 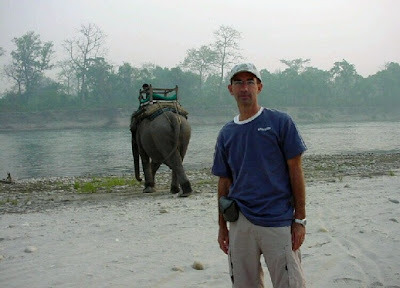 Six hours by car, south of Kathmandu, lies Royal Chitwan National Park. We took a flight from Kathmandu which took approximately the same amount of time to get there. The main attraction, and what we originally came to see, were the endangered one-horned rhinos. After arriving to the park, we were taken across the Narayani river in a small dug-out boat, then by jeep to the Chitwan Jungle Lodge. The lodge with it's 30 bungalows was originally built in the mid 70s and from the way it looked, not much had been changed. There is no electricity in the rooms so we relied on kerosene lamps in the evenings. The lodge is surrounded by sal forrests (shorea robusta) and grasslands, and there was no doubt that we were in a remote area. All our meals were taken at a community dining area in a mosquito netted tent. We seldom ran into other guests during our week there. Small groups of four or six would come and go after a day or two but most of the time it seemed as if we were the only guests there. "You come here for a very long time" we were told by some of the staff. "What can we show you today?" we were asked midway through our stay there. Indeed, they felt they had exhausted what they could possibly show us but in our eyes, there was so much to see. After our fifth night at Chitwan, with no other guests around, we were asked if we wanted to "walk through the jungle". So we said yes. Very early the next morning we were taken by elephant down to the river, all along being told we had nothing to be concerned about, and boarded a dug-out boat that took us down the river through a light covering of fog. Soon the air cleared and we stopped to take our breakfast on the banks of the river. After our breakfast we began our three hour trek through the jungle back to the lodge. Once again we were told that it was all safe and not to worry. Our party of six, Alan and myself, two guides, and two men carrying crates with the supplies and remains of our breakfast spread, was sandwiched between three rifle-armed scouts (one fifteen yards ahead and two others fifteen yards behind). We made our way through the jungle on the forested upper plain, 10 to 25 feet above the grassy wetlands where the rhinos were. The misty morning air and the deafening sound of wild birds contributed to the excitement of our hike. We did see plenty of rhinos below and were told that there were wild elephants in the area but we didn't see them. There are more than 43 species of mammals, over 450 species of birds, and more than 45 species of amphibians and reptiles in the park. The park is especially renowned for its protection of the endangered one- horned rhinoceros, tiger, and gharial crocodile along with many other common species of wild animal. The estimated population of rhinos is 400. The park also secures populations of endangered species such as gaur, wild elephant, four horned antelope, sloth bear, striped hyena, pangolin, Gangetic dolphin, monitor lizard, and python. 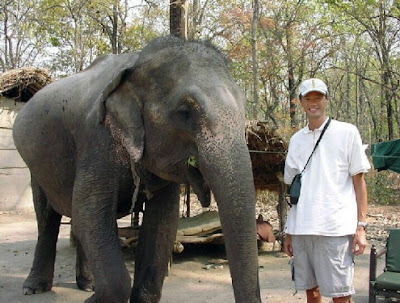 Safaris are generally taken by riding on elephants at Royal Chitwan. A wooden platform is mounted on top of an elephant like a saddle. You would ride straddling a wooden post mounted on one of the corners of the wooden platform. The advantage is that the elephant can plod through the jungle without startling other animals. One-horned rhinos were everywhere in the wet grasslands. At times, our elephant would be driven within 10 feet of mothers with their young. We would see no fewer than 15 rhinos on each trip out. The only downside at Chitwan, for me in particular, were the bugs. Lucky for me they weren't mosquitoes, but unlucky for me they were tiny enough to get through the mosquito nets. Insects seem to migrate towards me naturally, bypassing Alan altogether. These tiny little nats, or bugs would get under my clothing and proceed to forge a trail of bites all over my body. All it took were a few of them and I would have over 200 bites scattered from head to toe. I would slather my entire body with insect repellent each night before going to bed - to no avail (which by the way is something you're NOT supposed to do). Royal Chitwan National Park was for us an unforgettable experience. We didn't see any tigers, although there were a couple of sightings while we were there, but there were plenty of one-horned rhinos and we did get to see a sloth bear. Frodo and the gang have done much for the tourist industry in New Zealand. Since the release of The Lord of the Rings motion picture, tourism in New Zealand has increased anywhere from thirty to forty percent (depending on who you talk to). A visit to New Zealand must include a trip to the southern island and Fiordland. Auckland is an ordinary enough city with a great harbour and plenty of yachting activities, but you can get that in any one of a number of cities around the globe. Queenstown in summer. No skiers, but it does have the same feel as Mammoth or Aspen during the summer. The best way to see New Zealand is by driving. Yes, the steering wheel is on the left but outside the larger cities and towns, you can drive forever without encountering more than a half dozen vehicle's you could possibly hit. Sheep on the other hand, are a different problem, although in most areas, there is so much land for herds of sheep to graze on, they seldom need to cross a road. 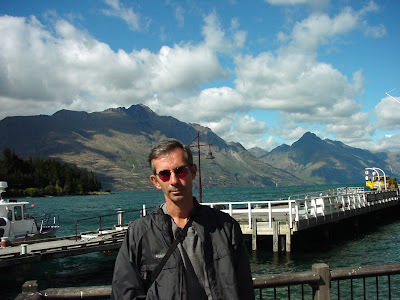 Our journey to Te Anau started from Queenstown, where most day trips to Fiordland originate from. Arrowtown, a small town just outside of Queenstown, with some 1,700 residents was originally built up during a gold rush in the 1860s. At the height of the rush, the town swelled to nearly 7,000 people. 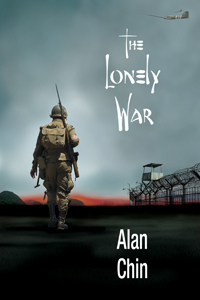 The Chinese were first brought in as cheap labor but within two years their numbers had swelled to 1,700. Today, Arrowtown remains as New Zealand's only living Historic gold Mining Town. We poked our way through the remains of the old Arrowtown Chinese Settlement. Didn't see a single other Chinese person around. One of around six boats set up to take tourists out to the Sound. We arrived and settled into a small motel in Te Anau the day before our planned trip out to Mildford Sound. However, everything was on hold due to some environmental "hazard" at the Sound. Apparently, someone had siphoned some fuel out of a tank of one of the boats, into the water, as a planned protest against the ongoing plans to perhaps expand the tours on the Sound. There's got to be a better way to get your point of "protecting the environment" through than by harming the environment. We were awakened and informed at 5 am the next morning that the whole mess had been cleaned up so we did make our two and a half hour scenic drive out to Milford Sound. The trip out the Sound was enjoyable and we could see the point of trying to stop any further expansions in the fleet. It is a beautiful place with dramatic landscapes but not unlike many other areas on the southern island. The town of Te Anau is not much more than a couple of streets with restaurants, shops, and motels. Plenty of places to get your Fiordland souvenirs, if you are so inclined, or kayaking, camping, or hiking(tramping) gear. Strangely enough there's also a sizable Korean supermarket. Or maybe not so strange. There are growing pockets of Asians relocating to New Zealand, especially from Korea. Other than all this, the town itself doesn't have much else to offer. What remains the highlight of Te Anau are it's natural surroundings. Hiking, or "tramping" as they call it in New Zealand. The southern island of New Zealand is truly a naturally scenic place. You can see why so many people spend so much time on outdoor activities. 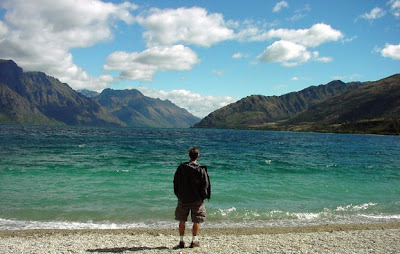 I once believed that New Zealand was "a long way to travel" to get to "not much there", and although it's true that our first few visits were a "stop along the way", we enjoyed every minute of our time there. So if you're into bold scenic landscapes and are on your way to Australia, or some destination in the South Pacific, you may want to swing by Fiordland. **Memories: Dramatic landscapes, deer farms, and "the worst spaghetti I've had in my entire life"
Our Yangon Airways flight from Yangon (Rangoon) touched down early in the morning on the tiny airstrip of the Nyaung Oo Airport. We were collected by a representative of our chosen travel agent in Myanmar and whisked away to our hotel just inside the crumbling ancient walls of Old Bagan. The ride through the flat, lightly forested jungle was a bit eerie with glimpses of the tips of temples and shrines with the orange glow of early morning sunlight on them. We had finally arrived to a place we had been dreaming of visiting for most of five years. 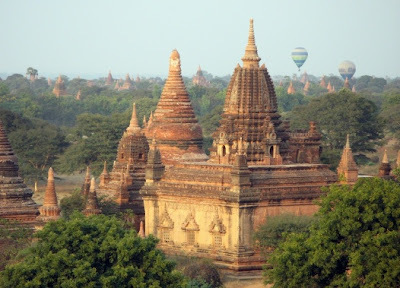 Bagan has some 2,500 temples, pagodas, and shrines spread over a 16 square mile forested area. 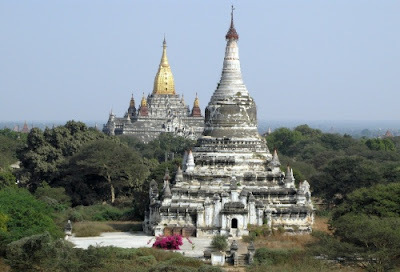 Many of the temples date back to the golden era of Bagan in the third century. During this period, more than 13,000 temples, shrines, and other religious structures were built. Over time, the mighty Ayeyarwaddy River has washed away about a third of Bagan, and with the ravages of wars, looters, and earthquakes we have what remains today. Many of the structures have been repaired, some even rebuilt, and there are even a few new small shrines being erected in the name of influential, probably military, families. 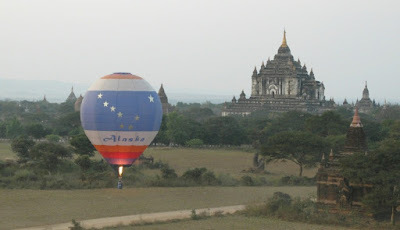 The Ananda Temple (background), soaring 51 meters into the air, was completed in 1091 A.D. by King Kyanzittha and is modeled after the legendary Nandamula cave in the Himalayas. It received its golden gilding in 1990 to commemorate the 900th anniversary of its construction. Contained within the temple are four great statues of the Buddhas representing the four ages. Kakusandha faces north, Konagamana faces east, Kassapa faces south, and Guatama, the most recent Buddha, faces west. We made daily visits to the Ananda and I'm wishing I were there today. 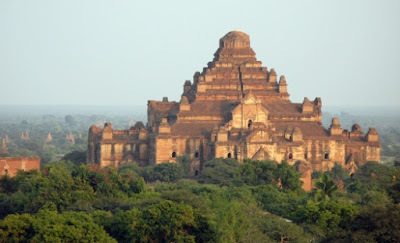 Dhammayangyi is the largest temple in Bagan and is a spectacular sight especially at sunset. Traveling around the dusty dirt paths was done easiest by horse cart. Hot air ballooning is probably a great way to see the area. We however, did not pay the $600+ dollars for a 40 minute ride at dawn or sunset. Ballooning over Bagan was run by a French company and I'm not sure how much of the money they collected went to the local people. 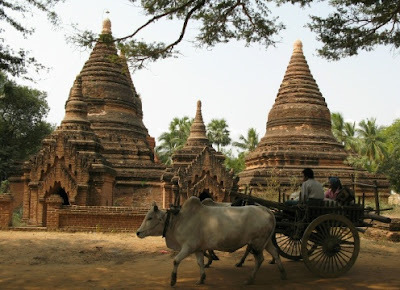 Unesco has tried unsuccessfully to designate Bagan as a World Heritage Site in recent years. Unfortunately the Military Regime has haphazardly restored some of the ancient stupas, temples and buildings, ignoring the original architectural styles. There are however many structures which remain relatively unscathed by the military reconstruction. 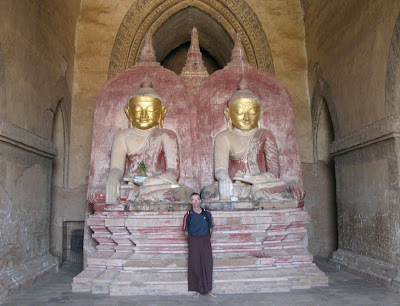 The decision to visit Bagan was not an easy one. We've all heard the reasons why we shouldn't go. Aung San Suu Kyi has asked tourists not to go. The government has used forced labour to reconstruct and build tourist-related sights and services, and international tourism can be seen as a stamp of approval to the ruling Military junta. But aside from the visual splendors of the place, there are genuine reasons for visiting. By going, we could help to support the local merchants and artists, and keep a vital link open between the Burmese people and the rest of the world. Human-rights abuses are less likely to happen in areas where the international community is present, and all the local people we encountered wanted us there. 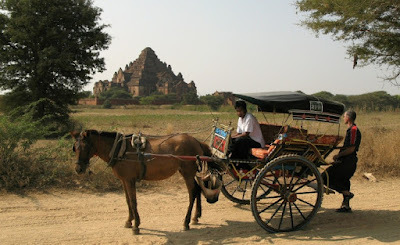 Our trip to Bagan was in the spring of 2007, before the troubles of last September. We do plan to return some time soon. The people we met in Bagan were some of the friendliest we've met in all of Southeast Asia; poor by many standards but still unspoiled by the ugly side of tourism. **Memories: Wandering on dusty paths, magnificent temples and shrines, warm friendly people everywhere, and coconut rice. 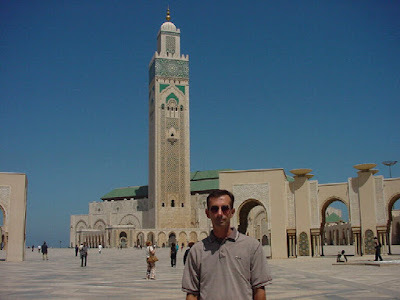 We made our way across northern Africa in the spring of 2001 ultimately stopping in Morroco. The Egypt Air flight from Cairo into Casablanca was packed with people returning home carrying all sorts of souvenirs and food items. I'm not sure what the agricultural restrictions are for bringing food into Morroco were, but it didn't seem to matter anyway since much of it was consumed before we ever landed. On our arrival at the airport in Casablanca, we followed a woman through customs and immigration dressed fully in a burka with only her eyes exposed. 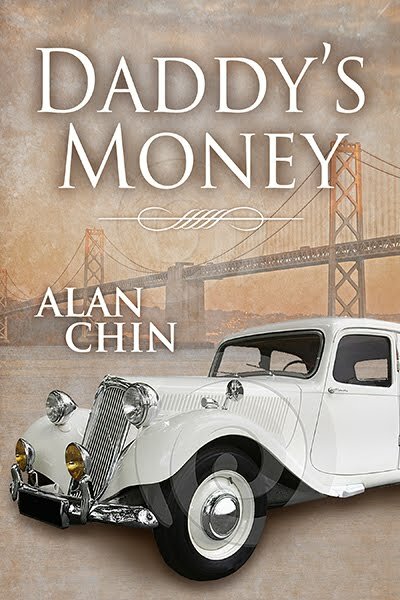 The immigration officer took the woman's passport, glanced up quickly at her face, and stamped her on her way. Our US passports drew a bit more scrutiny; what's your business here?, what are you going to see?, and where is your ticket out of the country?. Casablanca is a city with some three million inhabitants (10% of the country's total population). The people are not overly friendly towards tourists, unless they have something to sell to you, and even in our pre-9/11 visit, you could sense a bit of distaste towards westerners in general. None the less, most people are willing to lend you a blind eye as you wander through their city. 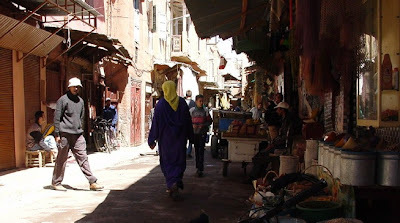 The Medina of Casablanca is a jumble of nondescript buildings with an array of shops selling very basic items. 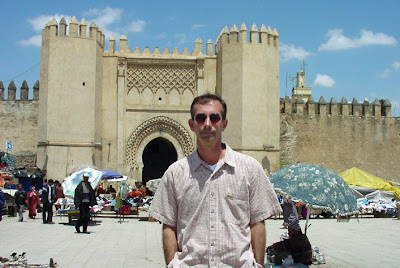 If you're here to shop, you'd fare better in the shopping areas outside the Medina or elsewhere in Morocco. Casablanca is not an overly impressive city. 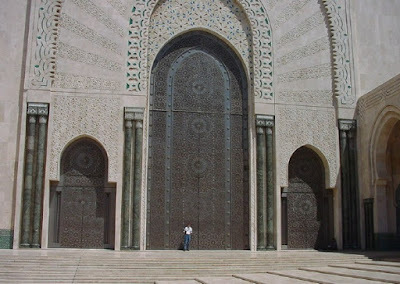 The huge doors of the Great Mosque Hassan II. The Mosque can be seen from just about any elevated area in the city. 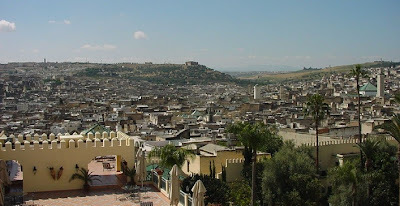 The Medina of Fez is undoubtedly the most fascinating of the Medinas we visited. It's a virtual maze of narrow paths which took us days to conquer. Divided into 187 quarters, each containing at least one bakery, hamman, fountain, and by law, a mosque, we were never without something interesting to see, and even more around each corner. A mosque hidden in the maze of the Fez Medina. 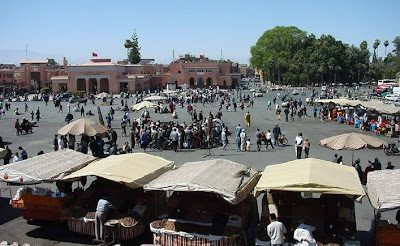 The marketplace just outside the Medina in Marrakesh during the day. The liveliest times on the square started around dusk each day. As people poured onto the square in the late afternoons, the place began it's transformation into a night market. Food stalls were being set up everywhere, many with an array of goat's heads lining the counters luring customers to grab a seat. Snake charmers set themselves up conveniently on walkways to stop tourists and locals alike. If you're looking for Rugs, this is probably the place to shop. We did meet a very enterprising man on the train platform when we left Fez for our trip to Marrekesh who "just happened to own a rug shop in the Marrekesh Medina". He eventually tracked us down in the Medina and we ended up looking at 200 or so rugs. The sultan's palace and gardens at sunset. **Memories: Getting lost in the Medina of Fez, being stepped on by a mule, tangine, and mint tea.